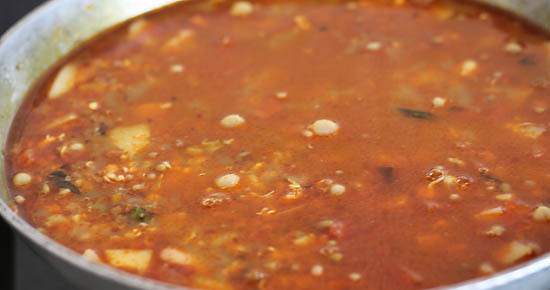 Misal Pav recipe with step by step photos. 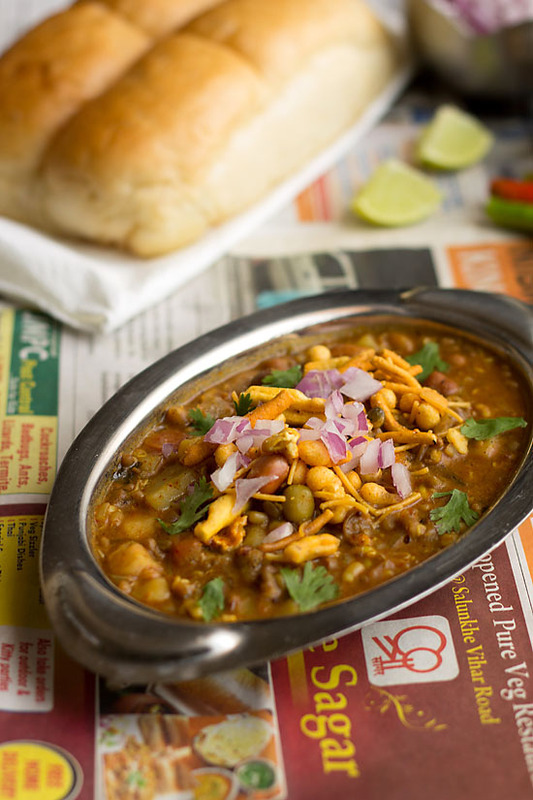 Misal is one of the traditional Maharashtrian dish and also a popular Mumbai Street Food! 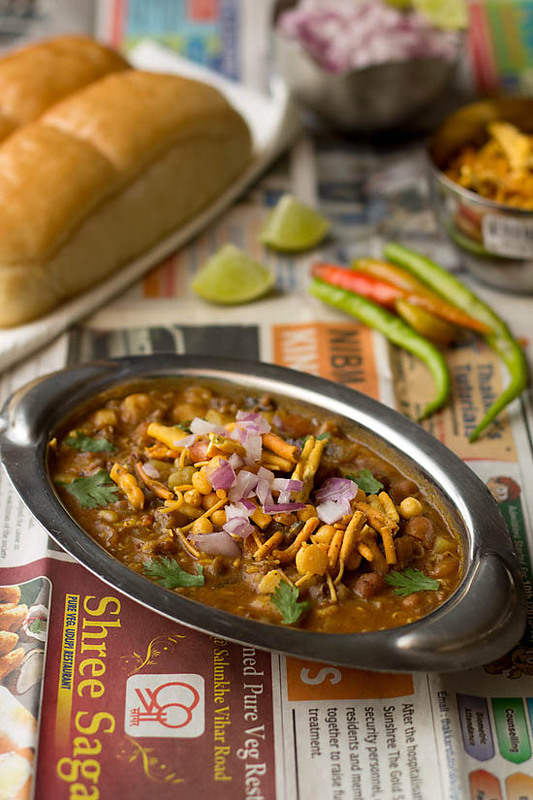 Misal is a spicy curry made with mixed sprouts or moth beans (matki) and pav are buns (laadi pav). 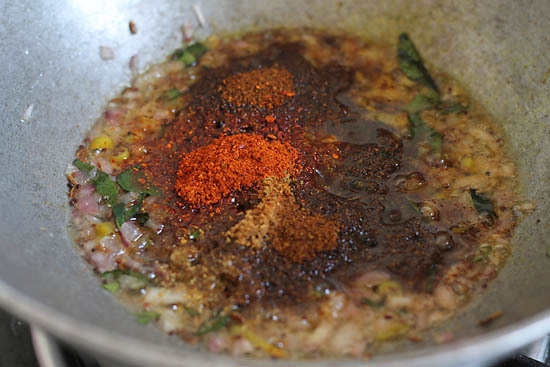 Misal is garnished with mix farsan (mix chiwda) on the top and also some topped with onion and tomatoes. Misal is made of various kinds and it differs from place to place. The Kolhapuri Misal is the most spiciest one also Puneri Misal is spicy and then there is Nagpur Misal, Mumbai Misal etc. 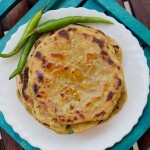 Some are served with butter milk or yogurt. Mine is a Mumbai version which I have grown up eating as a child. My mother also used to make misal pav for us but now I make them for my hubby 😉 My hubby drools over misal pav so I make regularly home. 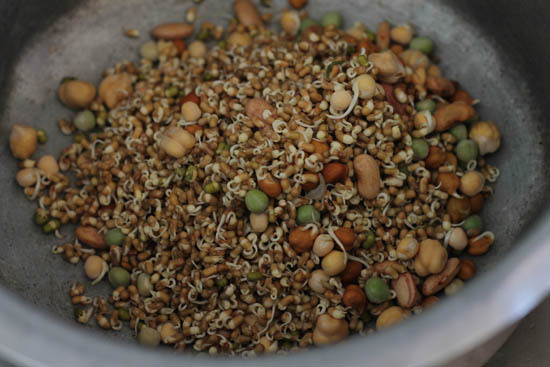 Mainly moth bean (matki) is used for making misal or even mixed sprouts are used. At places like Pune and Kolhapur two parts of misal are made one is the dried sprouts, second is kat which is the red spicy water. You mix them the way you like them to eat. You get very good misal at some places in Pune. There are some people who eat misal pav as their main meal. Due to sprouts it’s quite healthy and filling too. If you don’t like spicy then alter as per your taste. Goda masala or Kala (black) masala is added in making usal but if you don’t have them then add garam masala however the taste would differ. 1. Rinse the mixed sprouts in a vessel with water. 2. Then wash them under running water and strain the water. 3. Put the mixed sprouts in the cooker along diced potato cubes, tomatoes, turmeric powder, red chili powder, salt and a pinch of hing. 4. Pressure Cook the mixed sprouts upto 3 whistles with 3 cups water. 5. Heat oil in a vessel. Add mustard seed, cumin seed and wait until they crackles. 6. 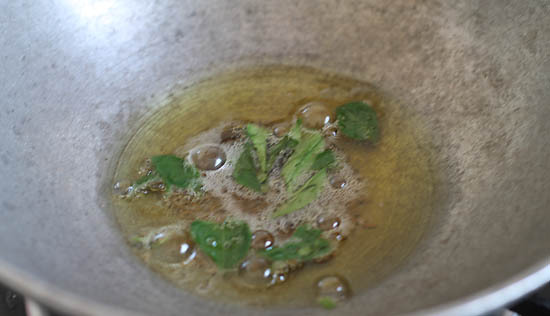 Add the rest of hing and half of curry leaves. 7. 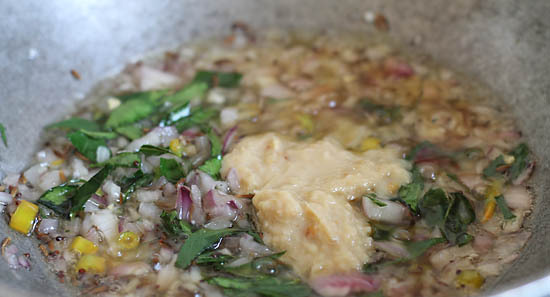 Saute onion until changes color to light brown. 8. Also add sugar and salt. 9. 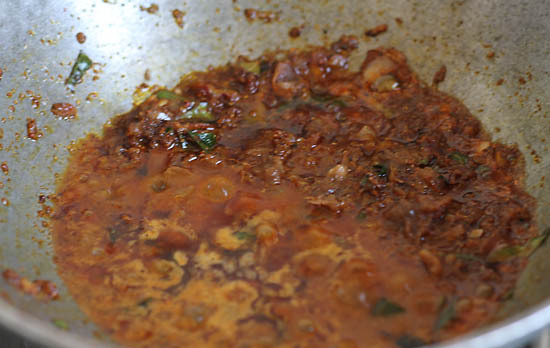 Now add the rest of curry leaves and green chilies. 10. Put ginger-garlic paste. Fry until the raw smell diminishes. 11. Also add spice powder. 13. Pour the tamarind pulp. Fry until the raw smell diminishes. 14. Combine all nicely. Fry for 2 mins. 15. Now add the boiled sprouts mixture. 16. 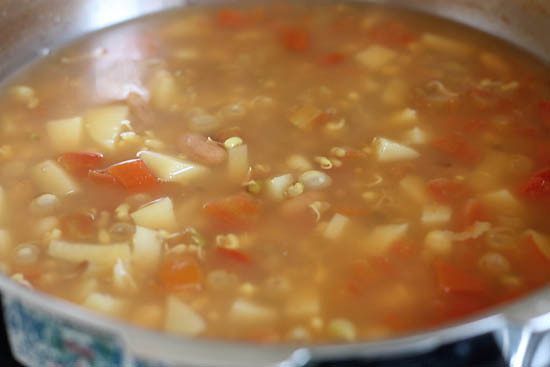 Also add the water left in the cooker if any or add water separately. 17. Cook until the gravy thickens. You could butter the pav or fry them in oil for 30 secs on each side. Pour the sprouts gravy half on the serving dish. Sprinkle some chopped onion, tomatoes, mixed farsan and lime wedges and serve misal pav with buttered pavs. I just served mine with plain pavs (buns) and it was yum. 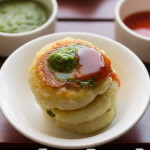 If you are fond of Maharashtrian food then do check batata rassa bhaji, batata poha, kande pohe, sabudana khichdi, sabudana vada and puri bhaji. 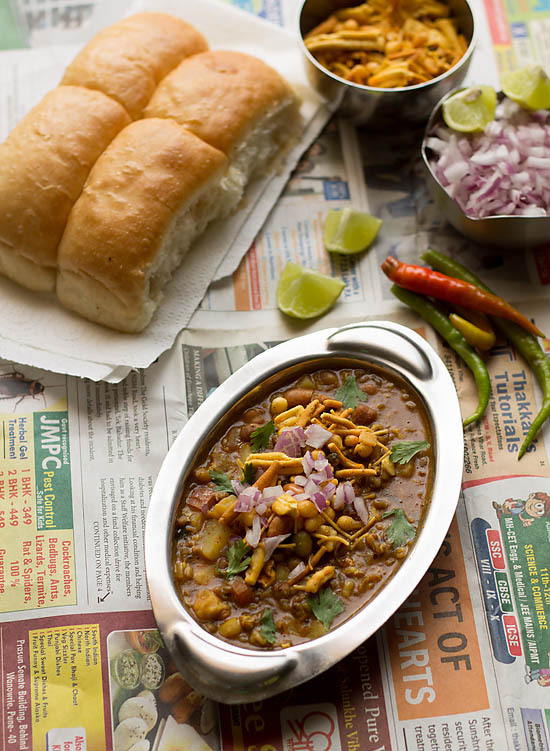 Misal Pav recipe one of the traditional Maharashtrian dish and also a popular Mumbai Street Food! Rinse the mixed sprouts in a vessel with water. Then wash them under running water and drain the water. 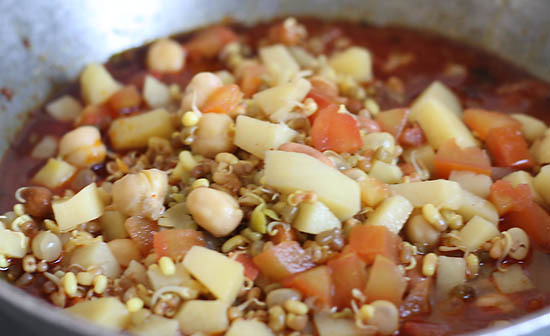 Put the mixed sprouts in the cooker along diced potato cubes, tomatoes, turmeric powder, red chili powder, salt and a pinch of hing. Pressure Cook the mixed sprouts up to 3 whistles with 3 cups water. 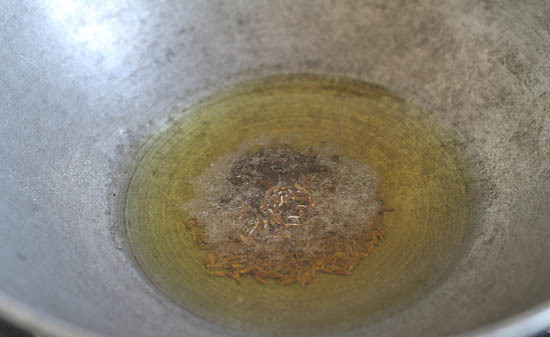 Heat oil in a vessel. Add mustard seed, cumin seed and wait until they crackles. Add the rest of hing and half of curry leaves. 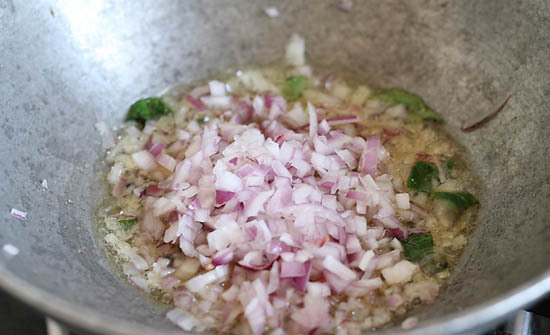 Saute onion until changes color to light brown. Also, add sugar and salt. 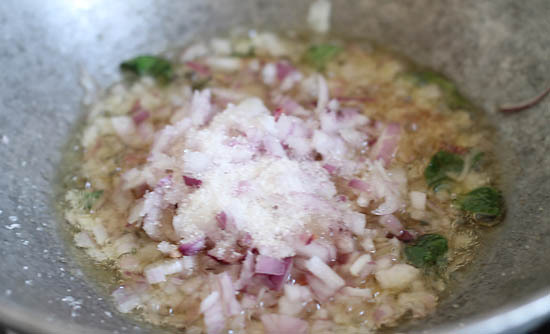 Now add the chopped onion, sugar, rest of curry leaves and green chilies. Put ginger-garlic paste. Fry until the raw smell diminishes. Pour the tamarind pulp. Fry until the raw smell diminishes. Combine all nicely. Fry for 2 mins. Now add the boiled sprouts mixture. Also add the water left in the cooker if any or add water separately. Cook until the gravy thickens. You could butter the pav or fry them in oil for 30 secs on each side. Pour the sprouts gravy half on the serving dish. 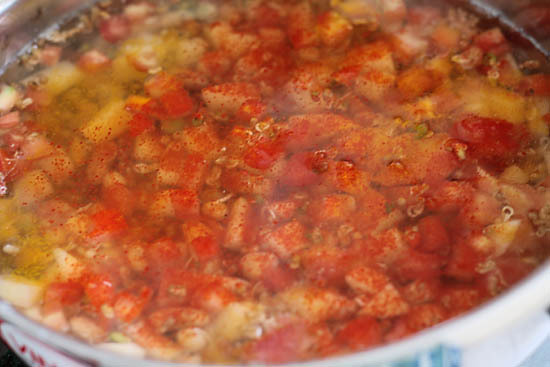 Sprinkle some chopped onion, tomatoes, mixed farsan and lime wedges. Serve with buttered pavs. I just served mine with plain pavs (buns) and it was yum. 1. 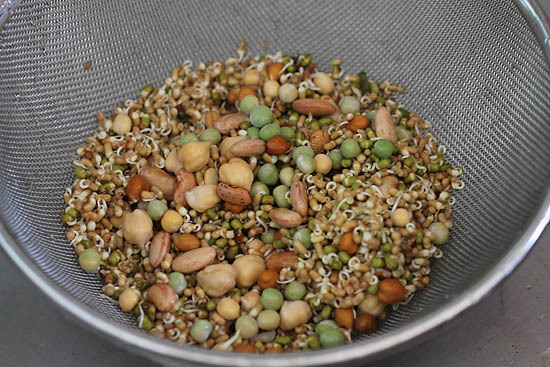 You could use matki (moth bean sprouts) or mixed sprouts. 2. If you don't have goda masala then use garam masala but the taste would differ. 3. Adjust the spices as per your taste and preference. 4. 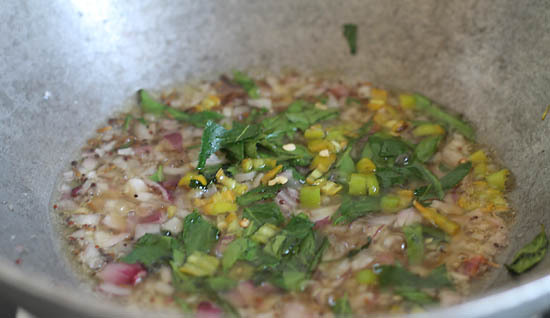 Generally the misal is of medium consistency so make accordingly. 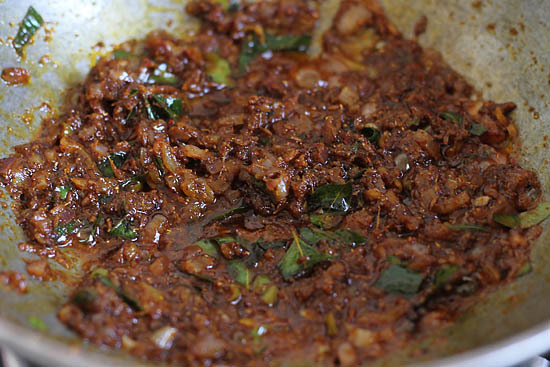 Hi how to make goda masala? 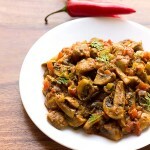 Is it a typical maharashtrian masala? I guess it’s not available in Delhi? Arpita you are right, goda masala is a typical maharashtrian masala. May not be available in Delhi but its available online and big super markets. 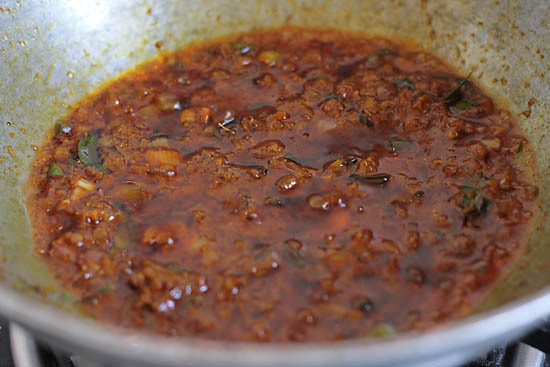 I will post the recipe for goda masala soon, allow me some time. In the meanwhile just add garam masala powder instead of goda masala. Hope this information helps you. Oh Maria, Maria….. I am in love with this recipe. Easy to follow and teekatt to the core. Made it today for Ganesh Chaturthi. We have about 40 guest so I am hoping they like it. Very pleased to know this Shivangi 🙂 thanks for positive feedback. All the best do let us know how the reaction was of your guests? Wish you a Happy Gangeha festival! It was superhit, got compliments that it was the best Misal they had in Dubai. Pleased to know this Shivangi, thanks for positive feedback. Glad your folks liked the misal pav. Tried it…turned out awsum…thnks a lot maria..? 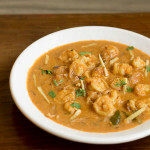 From Kala masala or godawful masala which is a better option? Followed this recipeqord for word and made misal twice already. Was a complete hit with family and friends. Thank you for the clear instructions and pictures. Note to others: I found that using the right farsan (misal farsan) gives the dish the authentic misal taste as is found in Pune. I used a batch of Puneri Misal Farsan in mine, and when I ran out of that, the substitute farsan didn’t come up to the mark. Nonetheless, the gravy (kat) tasted great ! Pleased to know this Shraddha 🙂 glad your family liked the misalpav. Also I agree with you puneri farsaan has a better taste then the ones you get anywhere else. Thankyou so much. Hi Maria, As we do not get the sprouts, could you please tell me what is the ratio or measure of various beans to use to sprout at home? Thank you. Surely Meenakshi would try posting kolhapuri misal soon thankyou so muchf or your kind and positive words. Tried it last nite.Awesome recipe maria.!!! 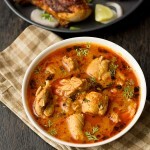 Hey I tried out this recipe, it was awesome…!! My family couldn’t stop asking for more and more pav.. 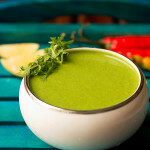 The best part about it is that it is packed with healthy ingredients.. And the taste is well…slurrpp..!! thankyou apurva quite pleased to know this 🙂 glad your family liked the misal pav. I trust your taste so please do it..
my family loved this misal recipe could you also post the kolhapuri misal recipe thanks. thankyou so much Cecilia 🙂 surely would take your request on our file for kolhapuri missal recipe. hope my wife love it.. 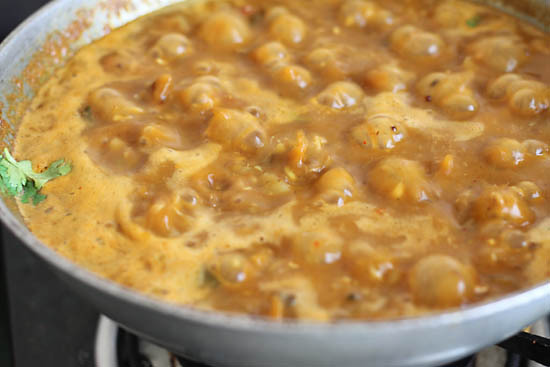 I prepare food once in a week, so thought let me try something maharashtrian dish this time .. Waiting for that little smile on her face…. Vow I am pleased to know this kudos to you 🙂 very happy and you are welcome…. keep cooking for her atleast sometimes…cheers! That’s okay Tanvi glad to know you liked the misal 🙂 sometimes simple food brings out the best flavor! take care have great weekend.